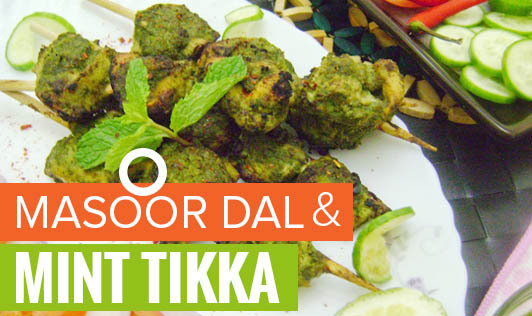 A tasty new snack with mint leaves and masoor dal you must try. 1. Clean, wash and soak the masoor in enough water overnight. Drain it the next day. 2. Combine the masoor with 2 cups of water and pressure cook for 2 whistles or till the masoor is soft and slightly overcooked, but not mashed. 3. Allow the steam to escape before opening the lid. 4. Drain the masoor and discard any excess water. 5. Combine the cooked masoor with all the remaining ingredients in a deep bowl and mix well. 6. Divide the mixture into 6 equal portions and shape each portion into a 2" diameter round and flatten them in between your palms. 7. Heat a non-stick tava (griddle) and cook each tikki over a slow flame, using 1tsp of oil till it turns golden brown in colour from both the sides.